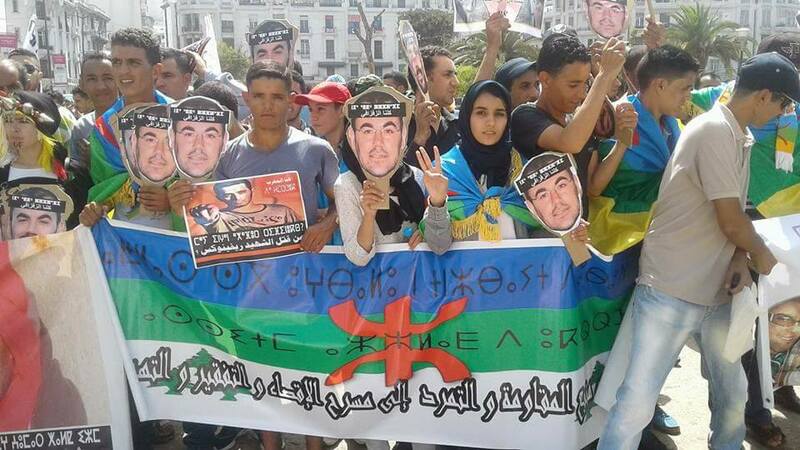 Leaders of the popular movement, the Hirak, in Morocco’s Rif region and a well-known journalist whose reports on the protest movement have earned him the enmity of the authorities began a hunger strike in jail, family members told the media in September. Nasser Zefzafi and Mohamed Jelloul, two prominent figures from the Rif who have played a key role in leading the movement for social justice which erupted in October last year, were among those reported to be on hunger strike. On 2 October, visitors to Mohamed Jelloul in Oukacha Prison found him too weak to stand, after more than a month on hunger strike, according to Nasser Zefzafi’s official Facebook page. Journalist Hamid El Mahdaoui, editor of independent news website Badil.info, also launched a hunger strike in mid-September, protesting at the decision of the appeal court to increase his prison sentence for “incitement to protest” from 3 months to 12 months. El Mahdaoui was arrested following mass demonstrations in Al Hoceima on 20 July, and accused by prosecutors of encouraging people to join the protest. Media rights watchdog, Reporters without Borders said it was “appalled” at the sentence. “The appeal court’s decision is incomprehensible,” the organisation said. Hundreds of other activists remain in jail, with courts increasingly handing down harsh sentences. International human rights organisations have condemned the Moroccan security forces and courts for torturing detainees and relying on coerced confessions to convict them. In a major report on police abuses in the trial of 32 men arrested in Al Hoceima, Human Rights Watch said the detainees had been tortured into confessing a plan to attack the police. October 11, 2017 in Morocco.